Education Costs > How Much Does a PADI Certification Cost? How Much Does a PADI Certification Cost? Provided by the Professional Association of Diving Instructors (PADI), this certification can be obtained at any PADI-approved dive center or resort. Training will feature three phases: Knowledge Development, Confined Water Dives, and Open Water Dives. The certification requires candidates to pass all three levels of tests in order to become certified. The PADI certification courses will cost about $250 to $500, and the training will usually last two to four days. This should include the course and the pool work. If you were to take the book portion, it could be less than $150; however, you would still have to pay for the pool portion. The pool portion will all depend on where you go, but it could cost an average of $200. Private lessons tend to be three to four times the amount mentioned. According to PADI, the prices for scuba diving certification can vary depending on location, class size, and other factors. The Scuba Shop, an education center located in Mesa, Arizona, charges $525 for the entire open water course, according to the official website. The tuition costs will cover the tuition, the pool time and classroom time. Most centers should also include the use of regulators, buoyancy control device, the tanks and weight belts. Becoming a scuba diver will require you pass all three phases: the knowledge development, confined water dives and open water dives. During the knowledge development phase, you will learn the basic principles such as how to choose the right gear, underwater signals, diving procedures and what to consider when planning your dive. This phase will be taught using the PADI Open Water Diver Touch™ on your tablet, online with PADI eLearning® or via a paper-based manual. In the end, you will take a final exam. During the confined water dives, you will focus on diving and learn the basic skills needed in a confined swimming pool. Here, you will learn about setting up your gear, how to enter the water, how to get water out of your mask, buoyancy control, safety and basic navigation. Once comfortable, you will go on to your final phase, the open water dive. Your last phase, the open water dive, will be in the open water. Here, your instructor will make you perform four dives, usually over a two to three day period. You will get the explore the underwater work and apply all the skills you learned in your first two phases. All courses will be flexible and will work on your own schedule, but if you’re aggressive enough, you can be certified within four to five days. Once certified, your certification won’t expire. However, it is recommended you take scuba review classes occasionally. You need to purchase personal scuba gear such as the mask, snorkel, wetsuit and fins. You can rent from the PADI center or you may buy your own. Scuba gear can cost up to $1,500, and this will include everything from the goggles to the wetsuit. This price can vary, though, depending on which items you purchase. You can spend as little or as much as you want. Before you start your sessions, you will be asked to have the following: a mask, snorkel, fins, underwater compass, whistle and octopus container. For the open water dives, you will need a wetsuit, regulator with computer, buoyancy compensator, a hood, gloves and two tanks. All centers will vary, however. Before the class starts, they should be able to provide you with a checklist. Refer to the picture below to see what most schools will recommend. If you are on a tight budget, you don’t have to go to the beach to dive. Rental tanks can cost $10 to $22. Before signing up, know about any other additional costs. This can include study materials, boat fees and certification fees. Make sure you’re healthy enough to dive. Read this medical statement, and if you feel you can’t perform any of these activities, the training may not be worth it. If you do check yes on any options and want to proceed, you must get clearance from your doctor. The minimum age to dive is 10 years old. Students, who are younger than 15, will earn the PADI Junior Open Water Diver certification. Upon reaching 15, they will be able to upgrade. In order to go into the open water, you must be able to swim at least 200 meters nonstop or 300 meters with all your gear on. You must also be able to tread water for 10 minutes. 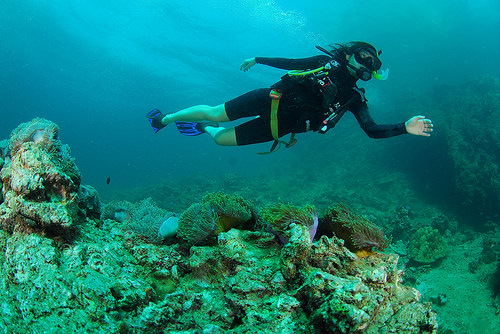 Use the official PADI search to find a qualified dive shop in your area. How deep can you scuba dive? The limit is about 130 feet; however, while training, you won’t go deeper than 40 feet. 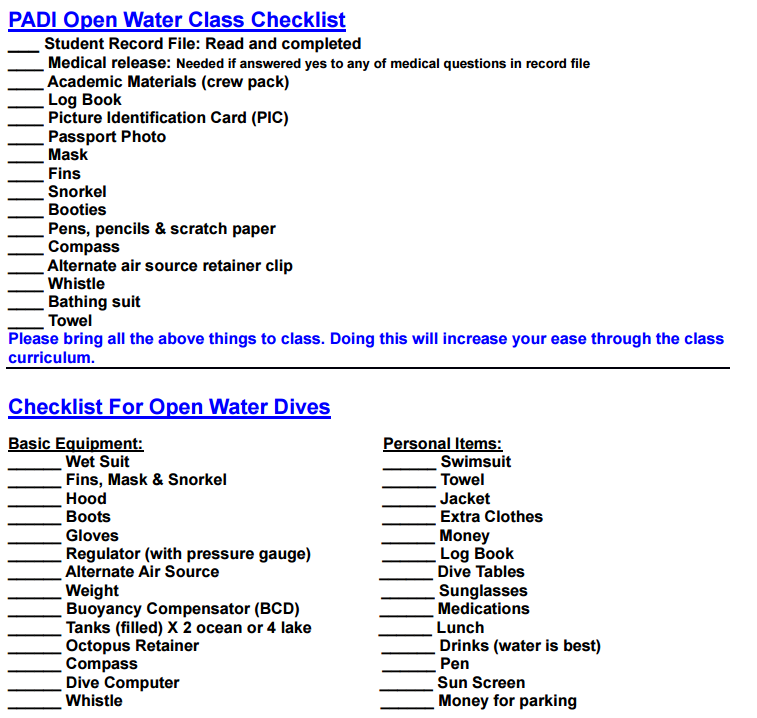 Training packages from different PADI centers may vary due to some factors. Be sure to find the best value while keeping your training level in mind. To save money, you may consider fewer training days since these days may have smaller fees. Instead of renting or buying the scuba diving gear needed, consider borrowing from someone you know who also dives. Before committing to thousands of dollars worth of equipment, rent or buy the basics first to make sure you’re interested. Many people find after three to four dives that it isn’t something worth pursuing. Look for sites that offer discounts for early booking and reservations. Many websites are going to allow students to register on their website. If you live in a busy area, consider talking with a handful of instructors. While many will list the prices on the website, many don’t. Be sure to talk with at least three instructors to ensure you’re getting the best price possible. Some centers may offer discounts to groups and government/military officials.